Originated at the Morden Research Station by Dr. C. R. Ure and W. L. Kerr, selected in 1954, tested as M366, and introduced in 1961. The tree is dwarfed to moderately vigorous, rounded canopy, with an open spreading growth habit, wide angled crotches and strong structure. It is only hardy to zone 3 if well protected, bears annually, is moderately productive, and resistant to fire blight. The fruit is medium to large 6.5 - 8.5cm ( 2.5 - 3.5") in diameter, oblong ovate, regular in shape, and matures early September. 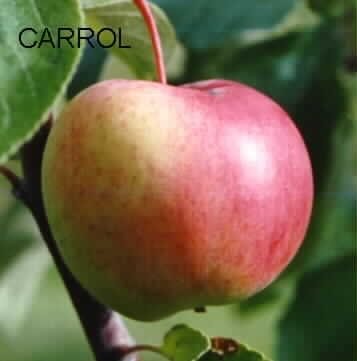 The skin is creamy green base covered almost entirely with medium red and a medium greyish bloom. The flesh is pure white with fine to medium texture, mellow, aromatic, sub-acid, with a spright but pleasant flavour. It is very good to excellent for fresh eating, good for cooking, and stores for at least 10 weeks to mid December. Is late to drop leaves. %Brix= 9. Is late to drop leaves, and has had some winter die back of branch tips, so may not be fully hardy at our location. Trees seem to come back well in the spring, so seems OK. From the USDA Germplasm website: Fruit: size 60-70 mm (standard); pale green, mottled and streaked rosy red. Texture soft to very soft. Flavor mild, good dessert, good sauce and apple pies. Ripens Sept. 1 and keeps 2-3 months. Manitoba Centennial Fruit (1970). Strong branching habit. Annual bearer; ripens early. Hardy to -50 degrees F. with occasional winter injury.